Dr. Flugrad is a native of New Jersey. He graduated from Woodbridge High School, earned his Bachelor’s degree from Rutgers College, and his Master’s degree in Nutritional Biochemistry. 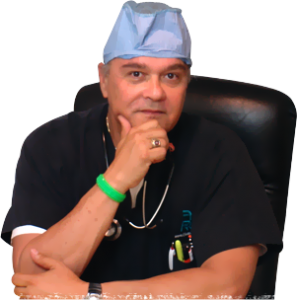 He graduated dental school in 1979 and did his residency at Jersey City Medical Center and UMDNJ. He is a fellow of the American Association of Oral & Maxillofacial Surgeons. Dr. Flugrad has been in practice in Perth Amboy and Old Bridge for over 30 years. In his spare time Dr. Flugrad can be found listening to his favorite rock bands, from the 60’s to today, watching his favorite sports teams. He is a master certified scuba diver and has dived all over the world. Dr. Flugrad keeps busy by riding his horse “The Sundance”. He enjoys life with his wife Liliana and their 5 children, riding motorcycles, skiing, hunting, fishing, and is an avid gun owner. He also has two cats, Merlin and Murphy.